NOTICE 10/23/2017: After a falling out with EA's community management, I have deleted my Origin account and have retired indefinitely from The Sims. Let's keep this one short. This was one of the most fundamental problems with The Sims 4 - the way Sims just sit with their fingers up their bums between each bite of food or swig of their drink. No wonder Sims take forever to eat! Well, I'm here to fix this problem! The problem is that the EAxis defaults put a lockout timer on the "active" eating and drinking actions (0xE882D22F Interaction instances 3441 and 341F respectively), to ensure that Sims always performed a passive action in between bites and swigs. Great to make sure families talk at dinner, terrible if you're all alone and just sit and stare into space. 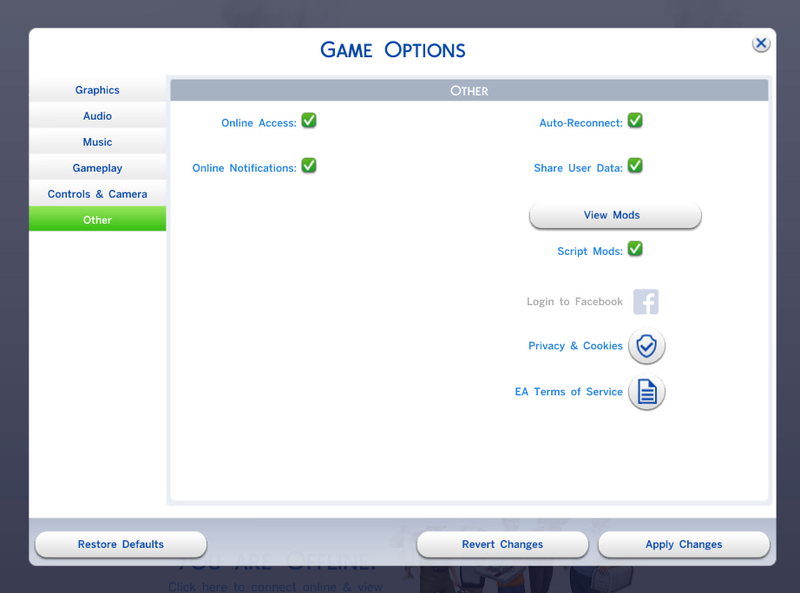 With my mod, my test Sims could take multiple bites and swigs in a row without sitting and staring into space in between. EDIT 1/25/2015: Now, the active eating and drinking actions are weighed much less. Previously, they were weighed at 1000, now they are reduced to a reasonable 5. Now, groups might take a little time to chat. 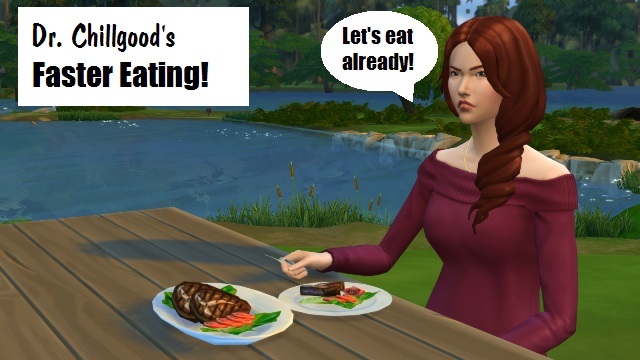 EDIT 2/24/2015: I have reduced the weight of the active eating/drinking to 2, further increasing the chance that Sims will talk at the dinner table. Eating alone is not slowed down. EDIT 1/12/2017: UPDATED FOR THE TODDLER PATCH. Apparently the only difference is that the active eating has more entries for buffs from DLC (Dine Out?). Now it should work even with said DLC, but I don't own any of it. MadameButterfly has a mod that speeds up eating, too. My mod does not conflict with hers. She changes the passive eating and drinking actions. I did test to make sure that it was my mod and not hers that speeds up eating. Paste Magazine for the picture?